Pasta di San Giuseppe is a basic pasta dish traditionally served for San Giuseppe Day (St. Joesph’s Day) but can also be included on your Christmas Eve menu. 1. While cooking the pasta, preheat 2-3 tablespoons of olive oil in a pan and sauté the onions, garlic and optional (but recommended) hot peppers or Peperoncino Fiocchi (hot pepper flakes). 2. When the onions start to show some transparency, toss in the sliced anchovies and let cook for a few minutes. 3. Before you drain the pasta, save a few cups of the water. Add 1+ ladles of the pasta water to the pan with the anchovies. 4. Add some black pepper as the ‘sauce’ comes to a simmer. 5. Add the cooked pasta (al dente!) to the pan with the cooked anchovies. Add more pasta water if needed. 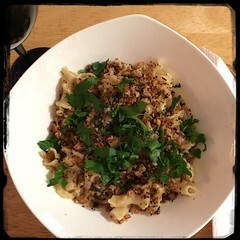 6, Mix well and top with breadcrumbs and a flat-leaf parsley.